Migrant City tells the story of contemporary London from the perspective of thirty adult migrants and two sociologists. Connecting migrants’ private struggles to the public issues at stake in the way mobility is regulated, channelled and managed in a globalised world, this volume explores what migration means in a world that is hyper connected – but where we see increasingly mobile, invasive and technologically sophisticated forms of border regulation and control. 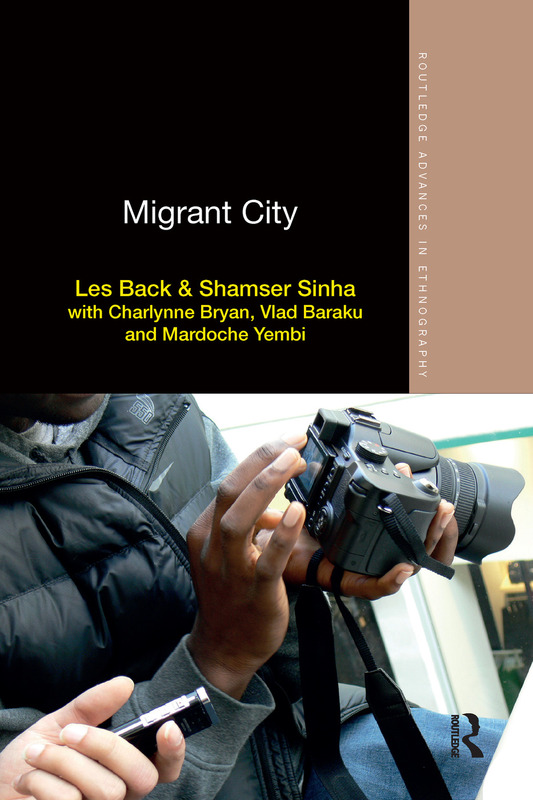 Migrant City is an innovative collaborative ethnography based on research with migrants from a wide variety of social backgrounds, spanning in some cases a decade. It utilises recollections, photographs, poems, paintings, journals and drawings to explore a wide range of issues. These range from the impact of immigration control and surveillance on everyday life, to the experience of waiting for the Home Office to process their claims and the limits this places on their lives, to the friendships and relationships with neighbours that help to make London a home. This title will appeal to students, scholars, community workers and general readers interested in migration, race and ethnicity, social exclusion, globalisation, urban sociology, and inventive social research methods. The need to think differently about migration was never more pressing. This book undermines many clichés and brilliantly reinvents how we should think through the dynamics of London’s migrant urbanism. Migrant City is an imaginative and original account of the flows of people and things that have done so much to shape London as a global city. It draws on rich ethnographic material to provide us with a way to think about migration differently and it raises questions that we need to explore if we are going to develop a better understanding of the everyday processes that have created and re-created London as a city of migration. It is a book that is of truly global importance. Migrant City is, at heart, a book of stories written and illustrated with young migrants about their relation to the city they live in, and expertly rooted in contemporary scholarly and political debates. The combined authorial team of participants and researchers enables a ‘sociable people writing’ that skillfully and critically explores the journeys migrants make and their lives in the city; evokes their roles in the making of places they inhabit and the imprints past dwelling places make on them; and juxtaposes the speeded-up time of global neoliberalism with the dead time of waiting for papers, for status, for life to begin again. Migrant City is one of the most important books on London in recent years. Through careful and unhurried research over an extended period of time – the likes of which are increasingly difficult in the academy today – Sinha, Back and their collaborators provide an indispensable map of what they refer to as the city’s ‘divided connectedness’. In a conjuncture characterized by a pervasive anti-immigrant rhetoric that suffuses public culture, the book’s collaborative ethnographyworks tobring into representation the everyday narratives of young people who routinely negotiate ever more draconian technologies of border control and forms of racial abjection. Migrant City also expertly delineates the historical, social and geopolitical narratives that have contributed to the precarities so many young immigrants in London face. This compelling, lucid and very readable book asserts both the reality and humanity of mobile lives lived in a city as divided as it is connected. It is a book that deserves as wide as possible a readership because it is a book positioned to change the story about immigration in these ‘anti-immigrant times’. Migrant City is an exceptional book. Elegantly written, beautifully visual and profoundly humane the authors skilfully bring a range of interdisciplinary into focus to understand contemporary urban life, multicultural London, mobility, exclusion, resilience, racism, space, time and gift giving to the life stories of the young migrants who have worked with the authors. It is bold and brave book too. It debunks anti-migrant arguments, reemphasises inequalities and relations of power, the flows of capital and the harms of racism but does so alongside a new emphasis on the capacities (and tools) for being convivial. Migrant City will surely become a classic. Back, Sinha, and their collaborators have produced one of the most sensitive and textured accounts of urban multiculture I have read. The deep insights captured by their ethnographic ‘listening’ brings the stories of young immigrant Londoners to life, at once situating them in the everyday while linking their experiences to wider contexts of history, race and geopolitics in a time of proliferating borders and increasing human mobility. What I love about the book is the way it always stays true to the complexities, connections and contradictions these young people navigate everyday. This book reminds us what is at stake in these post-Brexit anti-immigrant times: the fragile lives of vulnerable young migrants whose voices deserve to be heard.